I bought a beveled glass snowflake on my latest trip to Colorado and hung it in the window in an effort to entice Old Man Winter to pay us a visit in the South. If he chose not to do do, at least I could pretend that he had as I opened the blinds every morning. But there was no need to pretend today. The snowfall outside my window was not a dream. The warmth radiating from my soul was the fallout of a couple of inches of snow. Snow. That’s my favorite word, if I had to chose only one. Something about the way it takes its time reaching the earth reminds me that I am ok in this hurried, frazzled, distant planet where I seldom feel at home. 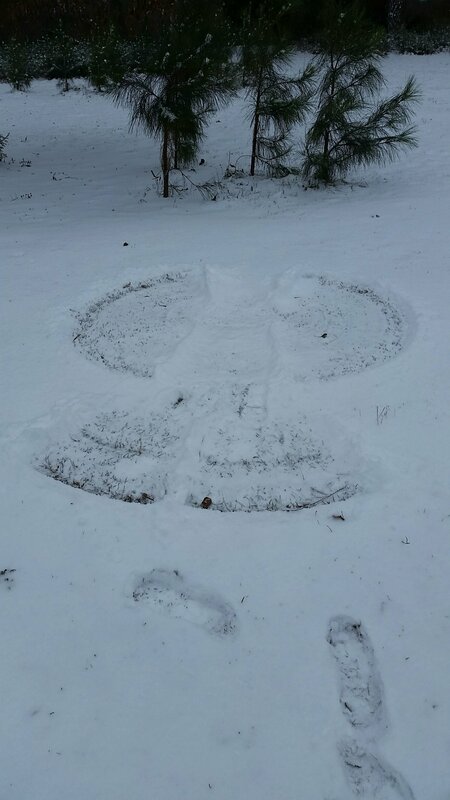 I gently stepped on nature’s blanket and made a snow angel. Angel. Ethereal being found here on earth. In the snow. The Bon Iver song “Lump Sum” has always sounded like snow to me, if snow were a song. What winter soul wouldn’t love a band whose name is a stylized spelling of the French greeting Bon Hiver, meaning “Have a good winter”? The song is gentle. Snow falls gently. Gently.